For the past seven years, the Organic Twilight Tour at Durham Horticulture Farm has provided the northeast Georgia farming community and those who are simply curious about where their food comes from with a chance to stroll walk UGA’s 90-acre organic research and horticulture farm and learn about the latest information about organic growing methods. 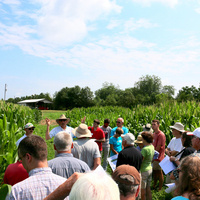 Faculty and researchers will be at their plots to talk about their research and best practices for small- and medium-vegetable and fruit producers. Topics covered will include natural pest and disease control, viticulture, no-till vegetable production, organic watermelon production, pollinator protection and bee keeping, and more.